We provide the fun, the friends, the adventure, and challenges that open doors for positive change. Rock-N-Water Christian Camps is located in Northern California and has a variety of youth summer camps specifically geared towards individuals looking to grow in their Christian faith through a sleepaway camp experience on their own or with a group of friends. In addition to the amazing amounts of fun and outdoor adventures that each of our teen summer camps contain, youth of all ages will find ample opportunity to make good friends with fellow campers as they experience the fun and challenge of the week together. Looking to plan your own specialty camp for a group of 6 or more people? Check out our Camps & Retreats for Groups. Remember the church camps you went to as a kid or teenager? For many of us, attending camp marked moments we had with God or our peers that were radically challenging and inspiring to us. We look back on the moments at camp, and remember a time where we really felt close with God or really connected with a friend who inspired us to follow Jesus. Our passion is to make Christian summer camp accessible to everyone, not just those plugged into their local youth group. It is our goal, that all youth would have an opportunity to spend time at an overnight camp and spend full days adventuring in God’s great outdoors. Rock-N-Water is a group of Christians who want to impact camp kids with the joy of God’s Living Word, so they might come to know Jesus and pass on God’s love with excitement. We focus our bible camp programming ministry on biblical principles, and we use the help of nature, friendship, and challenge on our overnight camps in California to develop character. Learn more about Rock-N-Water Christian Camps. Making a bunch of new friends at an overnight camp is a great experience. However, if our dates for individual camp don’t work for you, we would love for you to consider the other options available to you. Talk to your Church’s youth pastor and see if they’d be interested in organizing a camp for your Church youth group to on one of Rock-N-Water’s Christian sleepaway summer camps in California. If you live in California, there is a good chance that a local Church’s youth group will being coming to one of our teenage Christian Camps this summer during their school break. Contact us and we can put you in contact with a local youth group that might have space for you. Then you’ll be able to continue building relationships with each other after you return home. Consider getting a group of friends together for a personalized camp. It only takes a group of 6 people to be able to build your own specialized teen camps. Make it exactly the type of adventure camp you want it to be. 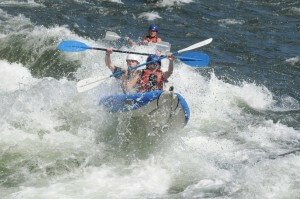 Getting to Rock-N-Water – Our retreat center is located in Northern California, about a 1 hour drive from Sacramento. Transportation instructions for parents of students attending individual camps at Rock-N-Water. We have many campers from the San Francisco Bay Area, Los Angeles and the surrounding parts of Southern California, as well as from across the United States travel to our California summer camp. It’s our passion to not only get youth into the outdoors, but to also help them to actually stop and experience the outdoors first hand while they are here. Too often, summer camps can bombard a youth with so many amazing options; that while they are sitting right in the middle of an amazing forest of God’s creation… they never realize it. We want to change that. Instead of arts and crafts, we’ll spend a full day exploring hiking trails through beautiful river canyons. In place of a climbing wall, we’ll climb and conquer real rock walls. And instead of the standard water sports summer programs of overnight camps, we’ll go whitewater river rafting. 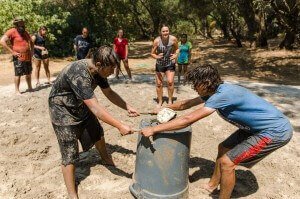 Be it a camp for boys or a camp for girls, these high adventures make for a California overnight summer camp resulting in camp experience unlike any other. What’s the value of going to a summer camp? Growth! Camp offers individuals an opportunity to get away from the constant distractions of everyday life. By breaking away from the routines, places, and the things that we find familiar, we are better situated to discover new things about ourselves, our friends, and our Heavenly Father. Learn more about Rock-N-Water’s Educational Objectives. What’s the value of outdoor adventures? Adventures in the outdoors provide a natural platform for helping to strengthen individuals emotionally, physically, and spiritually. By shifting campers out of their comfort zones, further away from the places and things that they are familiar with they are able to learn and grow. Outdoor adventures provide countless opportunities for growth through challenging activities when we leave the protection of our everyday lives. Read more about the value of the outdoors. For more information on our Christian youth camps and our overnight summer bible camps for teenagers, please Contact Us. We can also help you find church summer camps near year that you can connect with. We’d love to answer any questions that you might have about our overnight programs.